Among the titans of the culinary world, Jean-Georges Vongerichten stands tall as the consummate chef and restauranteur, deftly marrying techniques from the East and West, while managing a growing constellation of restaurants around the world. From Madison Square Garden to Columbus Circle to Shanghai, he wows us with his innovative vision. And if there were a figurehead for a unified food movement in the US, it would have to be chef, author and New York Times columnist Mark Bittman. His flagship book How to Cook Everything is the reference guide of a generation, a landmark work that defines our contemporary relationship with food and cooking. With his new role as the Times’ food columnist, he tackles the gnarly but pressing food and sustainability issues of our time, asking that we each take action for a better tomorrow. 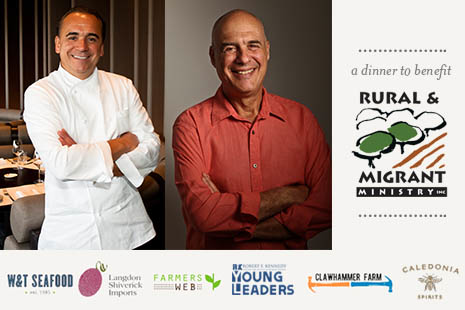 Thus, we are so very excited to sponsor the March Supper Club at Haven’s Kitchen, where both Mark Bittman and Jean–Georges Vongerichten will be cooking in collaboration. The dinner will take place on Wednesday, March 20th. Element Seafood will be providing oysters for the event (perhaps with one of these preparations?). Tickets are $300, and all proceeds from this event will benefit Rural & Migrant Ministry, a non-profit in upstate New York serving rural and migrant communities.